Have you ever had someone trash talk about you, behind your back thinking you would never find out? Have you had someone just be down right mean to you and you really want to get them back? Anyone come to mind as you read this you wish you could shut them up because of injustices done against you or someone you love? Ok, I’ve experienced it too, the day this photo was taken in East Mosul where we were trying to deliver a truck load of food and water with Team FBR into ISIS territory. One of our vehicles wound up getting hit by gun fire over 15x’s. And in a ‘shout out’ to the ATP Network, thanks for supporting our need for armored vehicles as these have saved many lives. One of our partners – Dave Eubank – was the target of sniper fire. A round fired directly at Dave’s face while he was sitting in one of our armored vehicles would have taken his life had it not been for that thick, bullet proof glass! So… back to getting even with your enemies! First, has God called you to get even? NEVER! Get Justice? Possibly, but not always. Forgive? YES, All the time! It’s safe to say most of you reading this, have not had a sniper try to “splatter your brain matter” or kill you and your friends with a mortar round. I had one hit about 80 to 100 yards to the right of me. Through it all, I have learned that we all have limited energy and we must be careful how we use it. Hate is a wasted use of your energy and is often destructive to your mind and body. ANGER can be much better. I think Jesus said, be ANGRY and sin not! This is a strategic, wise use of “turbo charged energy” for the right reason. That day our teams needed to get to the location that you see in front of me in this photo – about where the Power lines are. The problem was ISIS put up road block (see the mound of dirt on road behind the vehicle? We had to cut through the open desert ground. 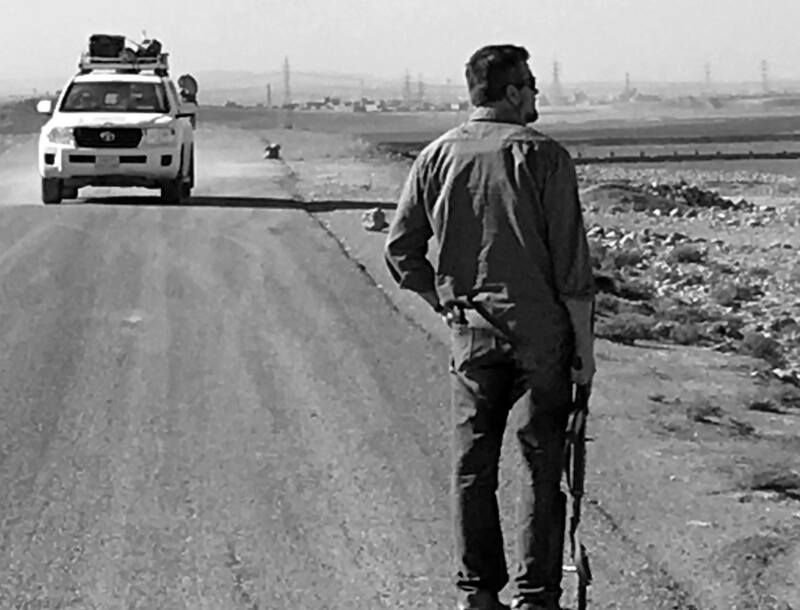 The ISIS stronghold was in the same direction we had to go, and they were trying to destroy us and our vehicles with mortar fire as we were flying through that stretch of ground. Did I get mad as they kept trying? NO! I was laughing and praying. Why? Hating would have done nothing! I flowed in and out of appropriate anger at what we saw and what ISIS had done, including seeing little girls that just been liberated, attacked. ISIS fired mortars at the children running to our location. Tragically, some of the kids injured from it. So, how about you? Have you learned the difference between “hate” and “anger?” In using anger to pray and to be an agent of change for the injustices of this world we acquire wealth to pour into God’s ministries to advance His Kingdom! If you move into that “Hate” realm, ask God to forgive you, because hate is not God’s best wish for you. Then I would say choose to forgive your enemy so you’re not wasting and having your precious energy sucked from you. PS. The location shown in the image above is where children were injured by ISIS. I would like to say how thankful we are for the Iraqi 9th Armored Division, a few Americans and US Air support. Those ISIS cowards that hurt kids and tried to kill us are dead, very dead.